Creative Daze! : Turnt Up for 10 Years of SOC! Turnt Up for 10 Years of SOC! Hi there! 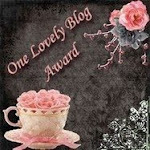 Hope you're enjoying the Scraps of Color Blog Hop celebrating 10 years! 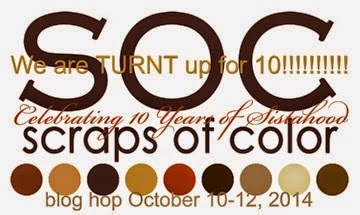 I'm so excited to be celebrating 10 years of the amazing community that is Scraps of Color! I was fortunate enough to find the group and join in 2010; I have enjoyed every moment of being a part of the group. I was welcomed warmly by so many of the members and was able to jump right in. I have participated in some great challenges (even though I was too scared to post my projects at first! LOL), fun discussion groups, and some excellent swaps. I consider it a blessing to share and be inspired by such a talented group of crafters! I encourage everyone to join in on the fun! Consider joining the community! 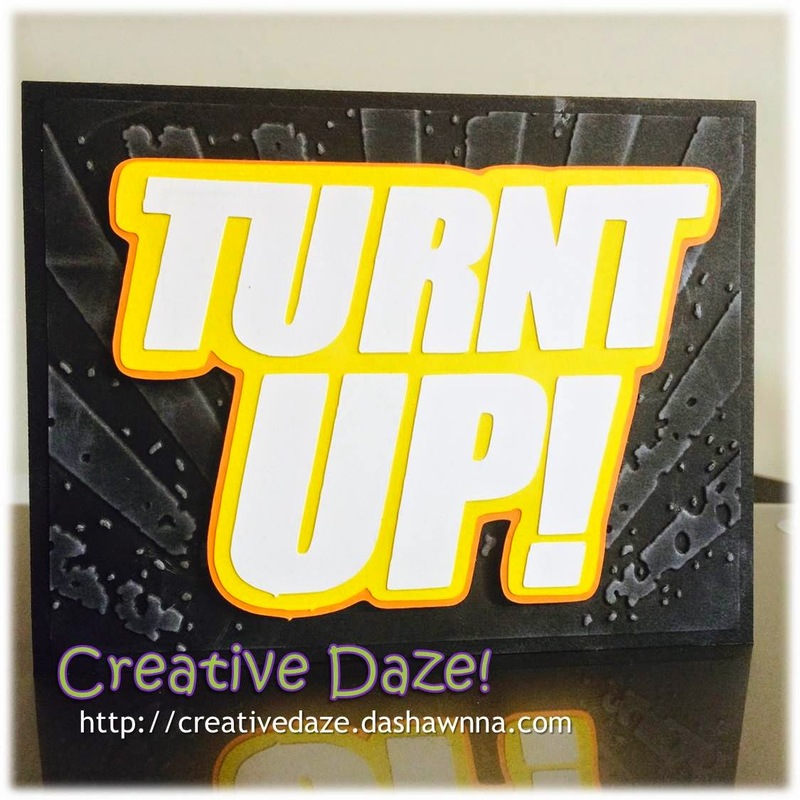 My first project for the swap is a funky card featuring our theme phrase TURNT UP! Okay, thanks for stopping by! Your next stop will be to Kimberly B's super cute blog: http://mypolkadottedbliss.blogspot.com/! I know your going to love it! Enjoy the rest of the hop! This is a very cool card. You got me considering a Cameo. LOVE that embossing with the white peeking out. So cool. Thanks for celebrating. Yes you did turnt it up. The yellow adds interest and a feeling of joy. Thanks for the inspiration! Very cool card, love the embossing & bright yellow! Love your technique of the dew drop inking. Makes a standout background. I'll have to try this. I just purchased a Cricut Explore and can't wait to do some custom die-cutting on my crafts. Great technique and card! Happy Anniversary!!! love your card! see you're an ENABLER.. another vote for CAMEO.. (another penny in the jar) lolol Happy Anniversary!! I love the bright colors and the sunrays speak of the good rays from this SOC community. Gurl go head!! Your card is very nice. I love the background and texture!! The embossing shows up really nice. Your choice of colors really pop! Very cool card, love the embossing and the way the title pops against the background...need to get a Cameo like yesterday! Cool card and embossing! Great job! Great card, Dashawnna! I love the inking over the embossing! And now I got Lil Jon playing in my head, lol...Thanks for sharing, and participating in the hop! That card dazzles. Thanks for sharing. Please feel free to use any of my creations for your personal use! But please do not to submit them for publication or profit. Thanks! (c) Da Shawnna Townsend. Powered by Blogger.